Happy International Women’s Day! We thought we’d kick off this blog properly today by letting you know about our exhibition, ‘Women in Parliament: Works from the Parliamentary Art Collection’. It includes more than 80 works of art dating from 1784 to 2014 of women, and about women, in the House of Commons and House of Lords. It’s up in Portcullis House in Parliament from now until July 2015, and it’s the first exhibition associated with our Vote 100 project. Much more to come! We’ve also been busy this week with lots of other International Women’s Day events. On Wednesday we had two talks, one by Helen Langley on Irene Ward, and one by our women’s suffrage artist-in-residence Mary Branson. Both talks were filmed and you can already see the one by Mary Branson on YouTube. She is presenting ‘New Dawn’, her proposed women’s suffrage memorial artwork, which will go on permanent display in Parliament when it’s finished. Among the attendees on Wednesday was Betty Boothroyd, former Speaker of the House of Commons. Here she is holding up a #votingmatters sign. 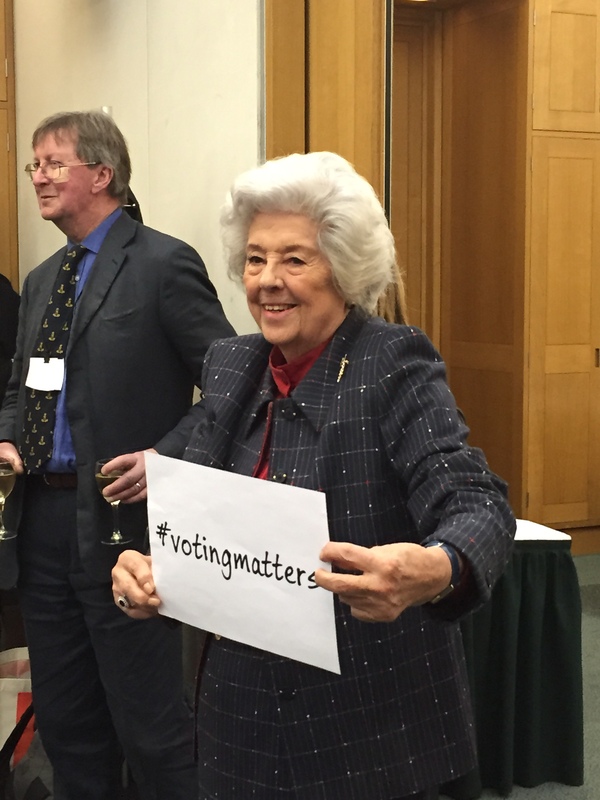 You can find out more about #votingmatters on Twitter. And if you’re on Twitter, do follow us for up-to-date information about us and our project @UKVote100. We only launched this week and are delighted to have more than 200 followers already! Do join us! Next Almost 100 years since women got the right to vote…but are we using it? Reblogged this on Parliament and Women in the early 20th century.